Rescue Encore was created with a single vision: train law enforcement officers, firefighters, and EMTs throughout the state of Maryland how to properly care for pets in distress. That vision has expanded to include all pet lovers and our mission is to provide top-quality training courses which allow for pet owners, service providers, and emergency responders to feel both safe and confident when faced with the need to render emergency aid to animals. Our instructors are life safety experts! 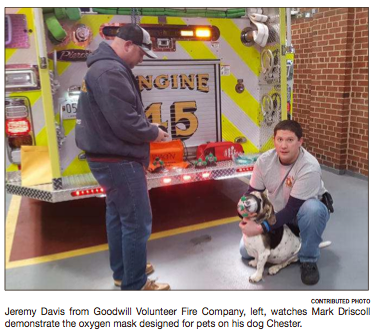 When we are not teaching pet emergency skills, we fill our time training volunteers to become Emergency Medical Technicians and Firefighters throughout the state of Maryland. We have received our instructor training from multiple agencies, including FEMA and University of Maryland’s Maryland Fire and Rescue Institute. Each instructor maintains certification through Pro Board® Fire Service Professional Qualifications System, International Fire Service Accreditation Congress, and approval through Maryland Instructor Certification Review Board. Our services have been developed out of necessity. In December 2015, American Red Cross discontinued their in-person Pet First Aid & CPR class. That left a large population of pet owners that had a desire to learn these skills with nowhere left to turn. After researching alternative programs that have been developed throughout the world, we determined that there was not an industry-recognized expert offering Pet First Aid & CPR training and certification that was specific to the fire service. As a member of Veterinary Emergency and Criticial Care Society, Rescue Encore has developed in-house courses in compliance with the latest scientific research and evidence-based practices adopted through the Journal of Veterinary Emergency and Critical Care. We also needed to find a program that offers pet oxygen mask kits and oxygen delivery training. The Wag’N O2 Fur Life Pet Oxygen Mask Initiative shares our vision, providing fire departments with high-quality pet oxygen mask kits at affordable costs. Fire departments have to do so much with very little and their funds have to be allocated to human life-saving technology and training. It is essential that emergency care for pets remain affordable and practical because funding will have to be provided by those with a vested interest. Rescue Encore is proud to offer in-person training of Wag’N products in addition to our in-house courses. Rescue Encore prepares you to rescue your pet again!